Today I drove “up t’north” – all the way to Birmingham, for the Young Dementia conference. And what a programme it was! We heard from those living with young onset dementia, both individuals with the diagnosis, and those caring for and supporting loved ones with the diagnosis. Hearing the voices of those living it is more powerful than listening to any professional describing what they think it might be like. We heard from professionals too, of course, and there was great passions in the room about delivering the services and support that families want and need. Frustration was felt, knowing that we are far from delivering. Real action and investment is needed. Creative and innovative service design. Research into care as well as cure. The voices have been heard. Now the work begins. Normally, I do not like being the center of attention. But when Sebastian Tomkowski asked me to dance the merengue, I said yes. Actually, my first reply was, “I can’t dance.” But Sebastian assured me he would guide me, literally, every step of the way. 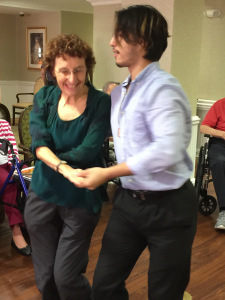 Sebastian is one of the dancers working with Rhythm Breaks Cares (RBC), a non-profit that specializes in bringing the energy and joy of ballroom dance to people who are living with dementia. We were lucky to experience one of RBC’s sessions in a New York City care facility. When everyone was gathered in a circle, Stine Moen, one of RBC’s founders, put on some Frank Sinatra tunes. Instantly, one woman danced her way into the room. Her movements were graceful and stylish. When Sebastian invited her to waltz, she readily accepted. Today is World Alzheimer’s Day so it seems appropriate that today’s blog is about highlighting the post code lottery that exists with regards to services for those of us with Young Onset Dementia….. The CCG’s Governing Body is responsible for the formal decision making for the organisation, which is responsible for buying and planning (commissioning) hospital, mental health and community health care services for the people living in the East Riding of Yorkshire area. Nicki Sparling, Assistant Director of Quality and Improvement / Deputy Lead Nurse of NHS East Riding of Yorkshire Clinical Commissioning Group (long name badge required!) asked me to talk to my local Governing body yesterday. “Delirium is a state of mental confusion that can happen if you become medically unwell. It is also known as an ‘acute confusional state’. Case 1 – 76yr old chap, admitted to hospital 5weeks ago. Two weeks prior to admission, was “his normal self”, still driving, no concerns except he was a little forgetful. He had a funy moment at a family wedding, where he became overheated in the sun and became irritable with his wife, but nothing significant. On the morning of admission, he again became quite feverish. Since admission, he has been acutely confused, hallucinating, fluctuating consciousness, changing mobility, aggressive outbursts. He has had every investigation the medics could think of, including a full MRI under general anaesthetic to rule out malignancy, full blood screening and lumbar puncture. CT brain scan showed some slight changes. Diagnosis – delirium, which may have triggered a dementia which had been slowly emerging prior to this episode. Sadly, he likely to now need full-time 24hour care. His family are understandably devestated, as this was very much an overnight change. Case 2 – 67yr old lady, admitted with shortness of breath and low sodium (a salt in the blood, which when low will cause confusion and dizziness). Three weeks prior, she had sought G.P. advice about an earache. Antibiotics caused her to vomit. She was also started on an antidepressant, which caused her sodium to drop. She felt unwell, so stopped taking it. Her family became concerned about her increasing confusion levels. There was no previous confusion or memory difficulty. On admission, she was found to be dehydrated and to have a urine infection, on top of the low sodium. She was also diagnised with COPD. Diagnosis – delirium secondary to dehydration, low sodium and UTI. The outcome for this lady is likely to be more positive – antibiotics will treat the infection, she has been rehydrated and she is no longer on medication which effects her sodium levels. Given time, her brain will return to normal functioning. Same diagnosis, very different outcomes. About 20% of hospital patients will have a delirium, but if you are an older adult and/or have a dementia, it is more likely that you will experience it. We are often referred patients for assessment of a “sudden onset dementia” when a delirium has not been picked up. We are also referred patients with apparent depression who have a delirium. In all cases, any cause of delirium, e.g. infection, low sodium, alcohol withdrawal, needs to be treated. Delirium can also occur following a trauma/operation due to the inflammation in the body and brain. Delirium can take weeks to recover from, sometimes months. Supporting carers through a sudden change in their loved ones can be tough. It is very distressing to see their spouse/parent experiencing such a change in their personality or being terrified by hallucinations. One of the keys to diagnosing delirium is talking to the families. What was the person like before this change? If there was no confusion or memory difficulty, delirium is the most likely diagnosis. Every day, either in a quote within a picture, or on an email footer or article about dementia, I see the wish for “A World without Alzheimer’s (or Dementia)”. 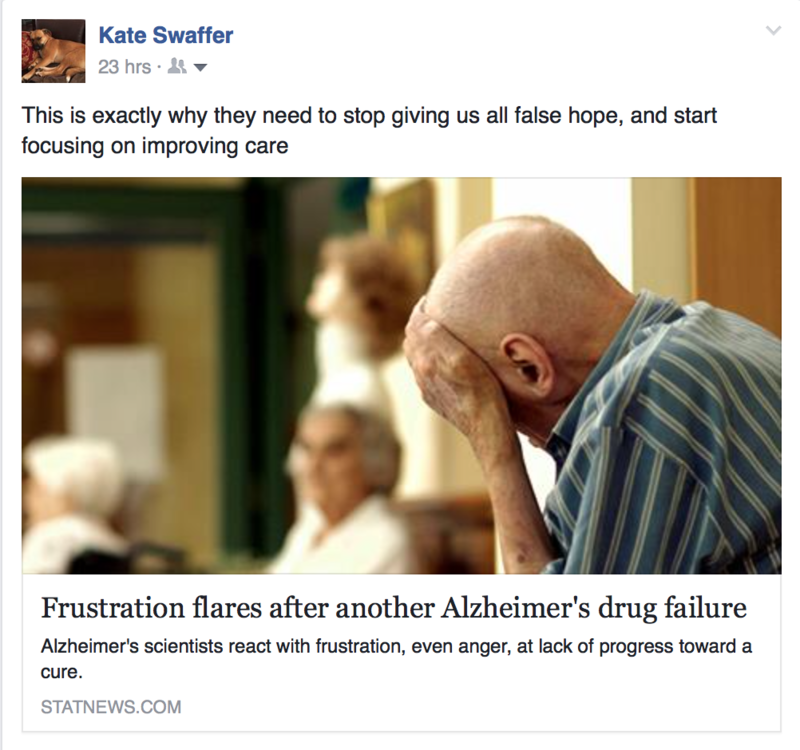 For World Alzheimer’s Month 2016, please let’s all start being realistic. Every time I see these quotes, I think to myself, “How ridiculous, especially when we are not even close to a cure”. For my continuing series of World Alzheimer’s Month / Dementia Awareness Month 2016 #WAM2016 #DAM2016 blogs, the post today is about the impact of hearing and reading about possible cures, and failed research. 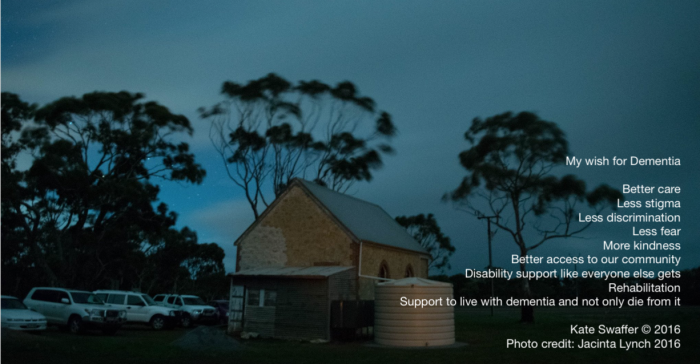 Members of Dementia Alliance International, and the much wider community of people with dementia and our families, are constantly being bombarded with this or that article or media release about an impending “cure or Alzheimer’s”. Whilst it is good to read and hear about research, there is also a very negative impact of this constant stream of FALSE HOPE. Considering many of us do not have dementia of the Alzheimer’s type, this is not only discouraging, but I wonder, will someone ever start to research our type of dementia more. So today I stood in the main entrance hall of the hospital, with my table and many leaflets, ready to spread the word about the new Carers’ Drop-In and Support sessions (which start tomorrow – eeeek!!). I spoke to some wonderful people, many of whom just wanted to share their past experiences of living with dementia, or share stories of neighbours they look out for, or simply to say “well done, we need this here”. I really do hope that the session is attended tomorrow – by at least one person!